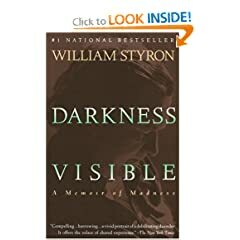 So I got a great deal on William Styron’s novel “Darkness Visible” which is a mediation on his clinical depression and his contemplation of suicide. I am really interested to read it because it seems so scary to be in an abyss of emotion like that of which there is no escape. Few people survive it and even fewer people have the ability to accurately write about it. I appreciate what Styron did to explore this for his readers, truly a great feat for all of mankind.